Mega Power Star Ram Charan’s upcoming action entertinaer, Bruce Lee, is all set for the censor scrutiny tomorrow. Currently, The film’s unit is busy wrapping up the re-recording and DTS mixing for the film and with this the entire post-production will be completed by this evening. As per the sources close to the film’s unit, the background score has come out quite impressively and the film’s team is elated with the overall output. Bruce Lee is gearing up for a grand worldwide release on the 16th of this month and expectations are sky high among the Mega fans. 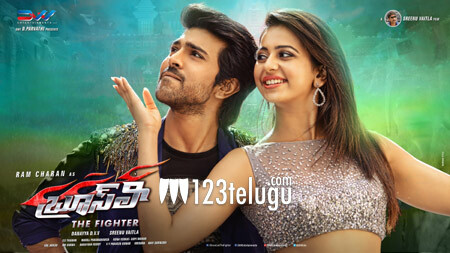 Directed by Sreenu Vaitla, Bruce Lee is produced by DVV Danayya and Rakul Preet Singh plays Charan’s love interest in the film. The film’s lavish visuals and Ram Charan’s energetic performance are expected to thrill the audiences.